Quite frankly I was pleasantly surprised when I tried my first bowl of this blend. I was a bit apprehensive, Sherlock is quite a name to live up to, but Sherlock's Reserve does this quite well. This is quite good for a mild English tobacco and I didn't have to dry out my bag at all. Fairly nice smell, but not a "wife pleaser" I'd say. Latakia and Virginia very apparent in the flavor, the casing is slight, perhaps an alcohol which is fine by me and nothing to detract from the essential "tobacconess" of the taste. For English smokers this might be a good all day smoke, for aromatic smokers this could be a Lat to get your "feet wet" on without being blown away. I think I'll be buying it again when I use mine up, and that won't be too long in coming. Sherlock Holmes kept his tobacco in the toe of a Persian slipper. Could it be that he had a particularly special reserve hidden away among his dusty old books where only he would know? This full English blend is both strong and rich with Latakia- Yet smooth and full just the way Holmes liked it. Sherlock's Reserve - A nice and darkly rich flavored blend. The burning Latakia is well balanced here and is a rather enjoyable smoke. Not the best VALA but pretty darn tasty! Worth a pouch worth. Another review by de la Fuentes: Would Mr. Holmes like this if he tried it? I think so. 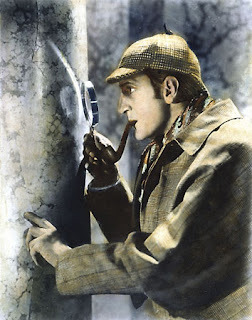 It's obvious from Conan Doyle's writings that the detective would have smoked Orientals or Virginias, definitely not the aromatic of the Peterson variety bearing Mr. Holmes' name.